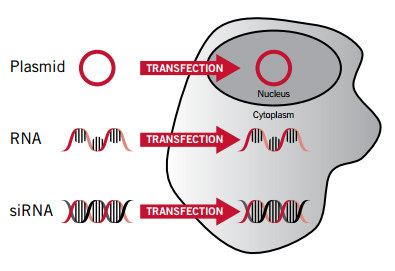 Traditionally, transfection has been the introduction of foreign DNA by non-viral means into cultured eukaryotic cells. 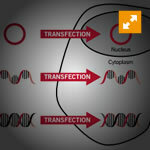 Currently, the term transfection applies to the introduction of any naked nucleic acid molecule, not just DNA, into cultured eukaryotic cells. ratio of transfection reagent to nucleic acid For each cell type, simultaneously transfect different amounts of nucleic acid using various amounts of transfection reagent. transfection complex formation time Test different transfection complex formation times (reagent + nucleic acid incubation time) for each reagent and cell type being transfected. cell density (confluency) at time of transfection Transfect each cell type at various densities ranging from 50% to 90% and monitor transfection performance. Post-transfection incubation time (time after addition of transfection complexes to cells) Harvest cells at different times post-transfection to determine the optimal assay time based on the experimental goals.